We posted a similar image of an Io and Europa mutual event from the New Horizons mission a few years back when it zipped past Jupiter on its long journey to Pluto. Our hero of freelancer image compositing Gordan Ugarkovic now presents to us a much better view. I count at least 4 if not 5 active eruption on Io in this version. The level of detail improvement from the same encounter is amazing. Old missions keep getting newer. It is true. You can become friends with all the best moons on Facebook these days. Who wouldn’t want to get closer to Io. Maybe get to know better Jupiter’s moon Europa. Maybe you live in the same Solar System as Enceladus?! The reason the left side is so blown out is due to the fact that the image was overexposed for Jupitershine and New Horizons cameras were designed for low light at Pluto which is ideal for observing the moons of Jupiter by light reflected off their host planet. However, doing this results in the total overexposure of the side lit by the Sun. This is another Jason Perry image and the original can be found here. Wanderingspace simply removed the lens flare noise and the overexposed color noise. He just added some New Horizons Io images that he has personally reprocessed on this page. Another nice find on the unmannedspaceflight.com forums… This composite by Ricardo Nunes combines hi-resolution and low-resolution images processed by Jason Perry to create this surreal horizon view of the Tvashtar Catena caldera on Io. Most of the hi-res data in the image is in the center with the low-res information on the outer parts of the image – thus falsely creating a depth-of-field which gives the image a real snapshot kind of feeling. See here for a wallpaper of this image. One of the most fascinating places in the Solar System to study would have to be the Jupiter moon Io. Previous to Voyager, the only image of Io available would be this image (at left) taken by the Pioneer 11 mission in 1974 which only hinted at what was to come with its slightly orange hue. Beyond this most scientists thought that Io would be another highly cratered and dusty moon very much like our own until Voyager returned its first highly detailed images. You can only image the shock of mission specialists when they got a look at this yellow, red and white pizza moon which was completely void of any sign of cratering. 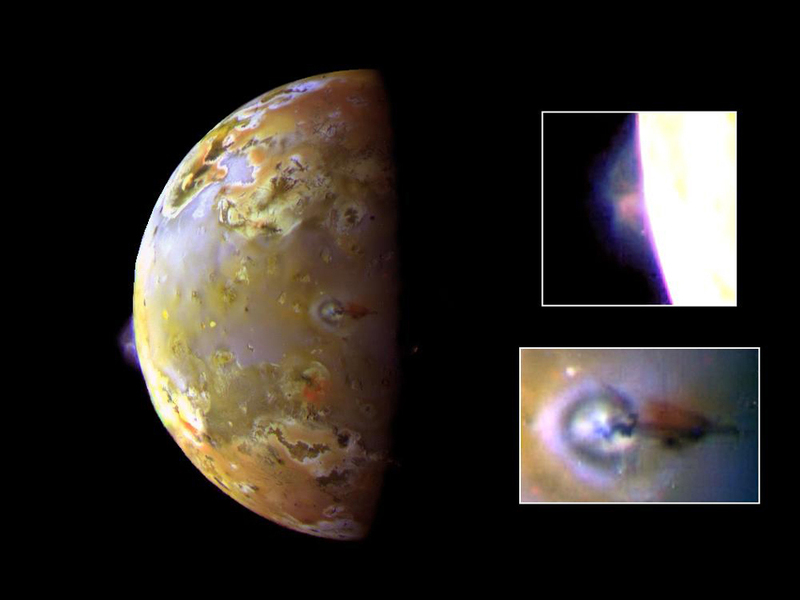 As it turned out, Io happens to be the most highly volcanic body in the entire Solar System. Enter the Galileo mission of the 90’s which stuck around for a while staying in orbit around Jupiter and not just driving by. Jason Perry is part of the Cassini Mission imaging team and has been re-processing these Galileo images of Io in his spare time. He has posted a large collection of these images as well as publishing a blog that specializes on all things Io and the images selected here are some of Jason’s recently processed favorites. 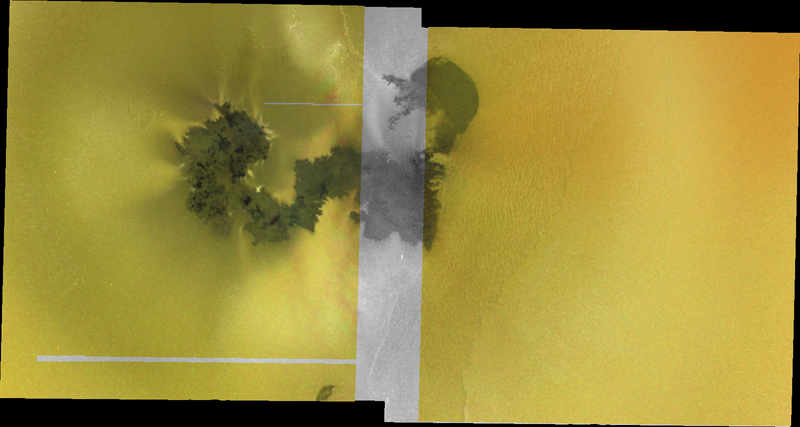 These two images are natural color images and most likely best represent what the human eye might see out the portal window of their spacecraft. When asked what he might like to say about these images to a general audience Jason responded, “The colors you see in these two images are largely the result of sulfur and related compounds. Sulfur on Io produced the general yellowish color of much of the surface. The reddish color of the polar regions is the result of radiation-damaged* sulfur. 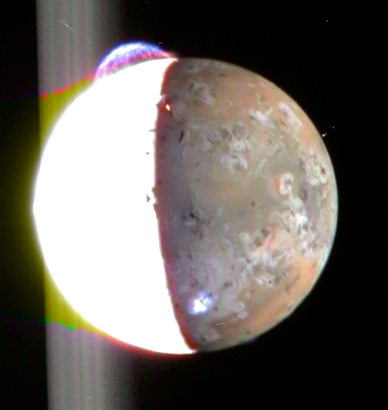 The whitish areas on the surface are the result of Sulfur dioxide: an industrial pollutant on Earth, a frost on Io.” Good information to mention about a highly volcanic moon as many people probably assume that all that red and yellow is similar to the molten rock images you see from here on Earth. * Jupiter’s magnetosphere traps the solar wind which produces a large amount of radiation. Io orbits within a region that is highly saturated by this radiation.